A tiny, white-tablecloth restaurant serving French-inspired cuisine. : Soft white walls, gold-framed mirrors, Moroccan-style green-and-white tile in the entryway and well-spaced tables topped with white linens set the tone for this upscale neighborhood restaurant. Arrive a little early and sit at the crescent-shaped, copper-surfaced bar to get a great view of the intricate ballet taking place in the small open kitchen fronted by chef de cuisine Ty Leon. With a few exceptions --- the signature lobster mac ‘n’ cheese, for example --- the menu changes monthly. You may find your foie gras fantasy in a starter that trumpets a trio of foie preparations: pan-roasted, blended into ice cream, and as a crumbled counterpoint to a cherry waffle. Main dishes might feature pan-fried red snapper paired with a poached prawn, ham croquette and corn bisque, or a newfangled version of beef Wellington with bone marrow anglaise and truffled potatoes. For dessert, it’s a toss-up between the strawberry lemon cheesecake and the banana pot de crème. 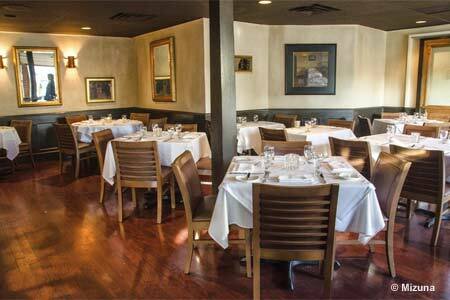 Service, overseen by executive chef-owner Frank Bonanno’s wife and partner, Jacqueline, is attentive but unobtrusive. The lovely wine list is extensive with several pours available by the glass, and the cocktail scroll is swelled with innovative concoctions.